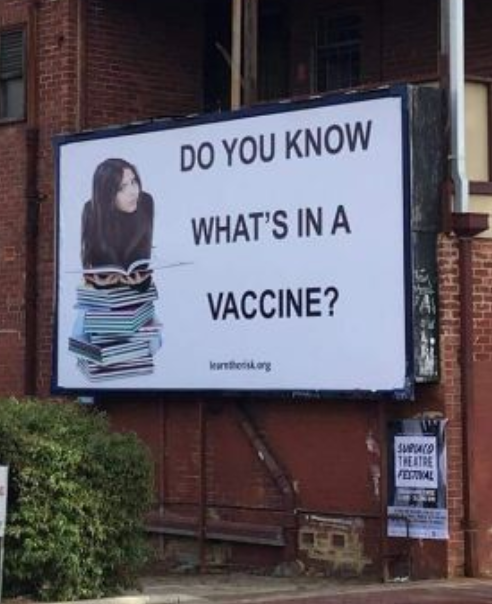 The above image of billboard, in Perth, Western Australia, which asked the questions “What’s in a vaccine?” was removed on 21 June 2018 one week into a four week contract. This site (https://www.learntherisk.org/) was started by an ex-Merck sales executive Brandy Vaughan who is now on a mission to warn people about the risks of pharmaceuticals, including vaccines. The ironic thing considering the huge outcry about the billboard is that if you would like to find out what’s in a vaccine before making a decision about it you can also find this information on many government websites. However, please note that while none of the vaccines on the NZ schedule list the mercury based preservative thimerosal on the data sheets, this may not mean that all the vaccines on the vaccination schedule promoted by the NZ Ministry of Health are in fact mercury-free. A study published in 2010 showed that there was a small amount of mercury in the vaccine Infanrix-hexa. (https://www.ncbi.nlm.nih.gov/pubmed/20391108). This vaccine is on the schedule in NZ for babies aged six weeks, three months and five months of age. Also, while most vaccines for babies children here in NZ (with the above mentioned possible exception of Infanrix-Hexa are mercury free, many of them still contain aluminium salts. This is a concern due to animal researching linking an aluminium adjuvant to brain damage. (Please see this link: http://www.naturalmedicine.net.nz/news/top-10-facts-about-vaccines-and-immunisation/). In NZ, children do NOT have to be vaccinated in order to attend childcare or school and parents can choose for their children to have some vaccinations and not others or to delay vaccinating their child until s/he is older rather than having vaccines administered according to the schedule promoted by the Ministry of Health. The organisation WAVESnz supports parents’ rights regarding vaccination.